“Citizen Koch” opens Friday at Sundance Cinemas. Not rated, 1:50, two and a half stars out of four. Co-director Tia Lessin will be at the 7 p.m. screenings Friday through Sunday. The documentary “Citizen Koch” is uneven and scattershot at times, but when you’re target is as big and fat as corporate money in politics, you can afford to be a little scattersot and still hit your mark. Wisconsin viewers will have a peculiar relationship with the film, which delves heavily into how billionaire dollars funneled through third-party groups backed Gov. Scott Walker’s election and subsequent recall election. But already, three years down the road, that footage feels like ancient history. 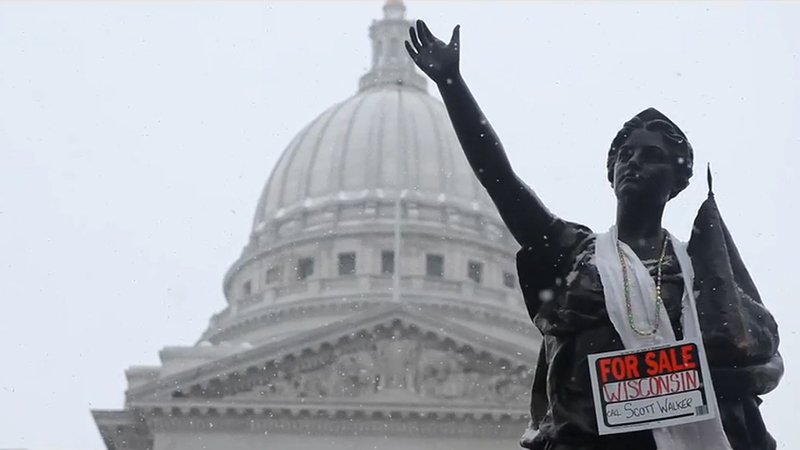 It’s the next Wisconsin that “Citizen Koch” is really made for. Co-directors Tia Lessin and Carl Deal began their film with a wide-angle look at the shifting nature of political contributions in America, kicked off by the Supreme Court’s Citizens United decision that opened the floodgates for unlimited corporate spending — not directly to campaigns, not yet at least, but to third-party Super PACs like Americans For Prosperity. 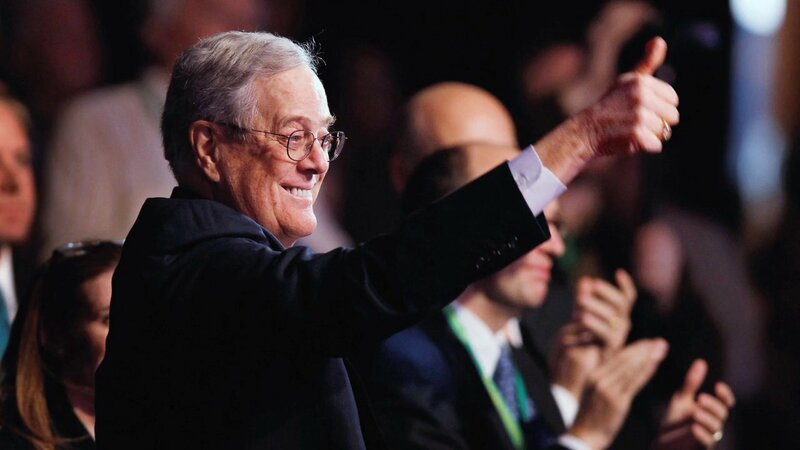 Billionaire brothers Charles and David Koch have been particularly involved in using the new rules to pull political strings via their checkbooks, both to protect their own business interests and further their own dreams of a free-market-driven society. Those dreams were made manifest in Wisconsin, when Walker was elected and almost immediately sought to break the influence of public-sector unions under the guise of a budget crisis. (He admits this, baldly, to a billionaire donor in the film.) With the new Citizens United rules favoring corporate cash funneling to Republicans, the only possible counterbalance is union cash funneling to Democrats. Ergo, crush the unions. While a nightmare for many Wisconsinites and union workers, Walker’s move was frankly a godsend to Lessin and Deal, as their wide-angle view suddenly shifts to a sharp and personal close-up. They follow the twists and turns in the Wisconsin struggle — the 14 Democratic senators fleeing to Illinois, the crank call, the ill-fated recall effort — but this feels more recorded for posterity than anything else. More compelling and timeless are the testimonials of three Wisconsin public-sector workers, all Republicans, who don’t recognize their party anymore. This should be enough for a pointed documentary right there, but then “Citizen Koch” makes the unwise decision to spend time on the 2012 presidential campaign trail with no-shot GOP candidate and former Louisiana governor Buddy Roemer. Gregarious and blunt, Roemer wants to get into a presidential debate to push his issues, which just happen to involve the corporate control of elections. But, wouldn’t you know it, the GOP keeps raising the bar for who gets invited to the debates, always just a little higher than Roemer can reach. To call his campaign quixotic would be an insult to Don Quixote’s solid anti-windmill tactics. Roemer is a fun guy, a happy warrior who brings a lot of energy to what is quite a downbeat film. But, in the final analysis, he really doesn’t have any connection to what’s going on in Wisconsin and only serves to pad the film out longer than it needs to be. Better that Deal and Lessin would have relegated his scenes to the bonus features on the DVD, and used that 20 minutes to dive into what’s happened with “Citizen Koch” since it premiered at the 2013 Sundance Film Festival and Wisconsin Film Festival. Public television’s financing arm abruptly canceled its planned financial support of the film, and a New Yorker article charges that public television executives were fearful of angering the Kochs, since David Koch had just pulled a seven-figure donation to New York’s WNET over another documentary that aired. That’s how powerful billionaires like the Kochs have come in today’s political climate. Not only can they get what they want by spending money, they can get people to do their bidding without even realizing they’re doing it.